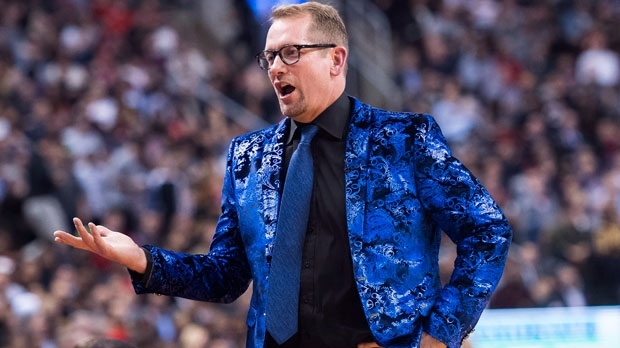 TORONTO - Nick Nurse looked sharp Thursday night -- and very blue. The Toronto Raptors coach donned an electric blue jacket to promote Sager Strong night in honour of late NBA sideline reporter Craig Sager, known for his colourful attire. Nurse looked like he had been moonlighting in a casino. Or as an Elvis impersonator. The Raptors game against the NBA champion Golden State Warriors was shown south of the border on TNT, whose studio analysts led the Sager tribute with some colourful outfits of their own. "Today we celebrate Craig Sager's spectacular style," the network tweeted. Canadian TV broadcasters Matt Devlin and Jack Armstrong also opted for courtside colour.